Before .. where did my kitchen go? I know you get it: my whole world feels topsy-turvy. Off kilter. A jumbled mess. Like somebody put my life in a cup and shook it like dice. From day to day, my fridge migrates to the oddest places; I’ve been thinking about attaching one of those electronic locators so I don’t have to call in the neighbor’s bloodhound every time I want a sandwich. Each morning I have to do an Easter egg hunt for my cereal bowl, which I found in my closet one day and the bathroom another. 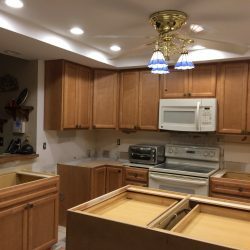 My dishwasher doesn’t seem to be anywhere at all (did I see one of the workmen loading it in his truck???) but my toaster oven is alive and well and happily decorating the TV. In the midst of all this chaos, during one of my what-was-I-thinking moments, I volunteered to take a meal to the family of a friend who’d just had cancer surgery. So there I was mixing muffins in the garage at 5 a.m. and trying to break into a non-pop-top can of creamed corn with scissors. Nope. A box cutter? Nuh-uh. How about a butcher knife? Nooooooooooooo. During. How will it end? I declare, before it was over, I would’ve given my firstborn for a can opener. The workmen were kind enough to plug in the stove for me and lift the tarp so I could slip the bar-b-que chicken in the oven. But by the time it was cooked, nobody was in sight. Must’ve been break time. So I had to finagle that huge pan of sizzling chicken out by myself, in the process accidentally giving it a good swipe of plaster dust coating the tarp. Um … oops. I scraped as much off as I could and covered the rest with grated Parmesan cheese. Cheese … the cure-all for cooking faux pas. So I’m just about done here. In every way. 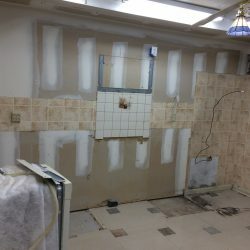 I WANT MY KITCHEN BACK!! And my sanity. And some peace would be lovely. Ever try to write a book in the room adjacent to total annihilation and destruction? Yes, I WOULD like a little cheese with that whine! Share Your Blessings Giveaway … Rose Chandler Johnson! 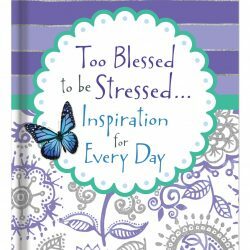 Rose will receive not just one but TWO gift packages featuring my new 365-day devotional, Too Blessed to be Stressed: Inspiration for Every Day, so that she can share her blessing with the friend of her choice. Thanks to all who entered the drawing; if you didn’t win this time, don’t fret – there will be another great giveaway coming very, very soon! 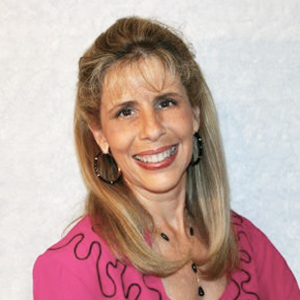 If you don’t already receive my free Too Blessed to be Stressed e-newsletter, I’d love for you to sign up for it at my website, www.DeboraCoty.com. Hugs to you, BFF (Blessed Friend Forever)!